Lottoland's Double Jackpot feature is an amazing way of turning a big jackpot into a massive one. With a click of a button you can double a whole host of jackpots on a wide range of Lottoland draws. Scroll down to find out more! Lottoland's Double Jackpot couldn't be simpler; with the click of a button you can multiply one of our jackpots by two, meaning you have the chance to win twice as much in the next draw! For example, this Wednesday's Lotto draw is a hefty €11 million. 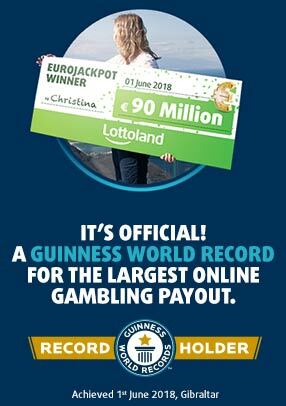 But by enabling Double Jackpot you increase the amount you can win to €22 million. 1. Pick your numbers as normal. 2. Click on the Double Jackpot button and slide it right. 3. Click the green Submit button when you're ready to proceed to checkout. Bored of waiting around for a large rollover or one of our exclusive Special Jackpots? Want to create your very own super-sized jackpot? Well then Double Jackpot is for you! Available whenever you want, giving you the freedom to make each lottery draw suit you. It's not restricted to one draw either, with Double Jackpot activated you can customise your ticket in all sorts of ways, giving you more chances to win your very own big jackpot. Want a shot at several Double Jackpots? No problem, just ensure Double Jackpot is checked on your ticket and then choose how many weeks you want it to run for. Double Jackpot costs double your stake, not bad when you consider how much extra cash you're loading onto the upcoming jackpot! Double Jackpot is just one of many amazing features that are available for Lottoland customers. We also have the hugely popular Jackpot Hunt feature, which automatically renews your numbers until a jackpot has been won. This means, in a rollover situation, you can keep chasing that ever-increasing jackpot until there is a winner. You never know, it could be you! That's not all, Lottoland provides numerous Special Jackpots throughout the year, boosting jackpots way beyond the levels of the main draw, giving you more chances to win bigger. In fact, we've even got one running right now - check out our massive PowerBall jackpot worth €449 million! Right now there's a lot of hype surrounding the upcoming Lotto draw. An €11 million jackpot is certainly nothing to be sneezed at. But with a click of the Double Jackpot button that number is eclippsed in an instant. Currently the all-time highest jackpot is €18.9 million - so if your numbers do come up you'd win the biggest amount ever on the Lotto!